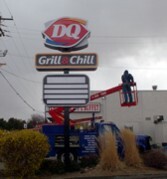 Aim Sign Company is a full service electric sign company founded in Southern Idaho in 1985. Over the years we have earned a reputation for consistently providing quality signs with prompt service and professionalism. Our facility in Boise houses the latest state-of-the-art sign manufacturing equipment, metal fabrication, painting, neon bending, and digital printing. We also maintain a complete array of installation and service trucks stocked with a full parts inventory to ensure rapid response to your maintenance needs. Call us today to discuss how we can help you with channel letters,	monument signs, backlit awnings, and electronic message centers. With our experienced staff, we can confidently assure every customer a comprehensive, professional signage program. Whether you require complete project design and planning, or simply adapting your company logo for signage, our highly skilled staff will work with you every step of the way to create an effective signage program that will reinforce your brand image, comply with all city codes, and meet your budget. Don't leave your customers in the dark! Contact Aim Sign today to get your signs fully lit and conveying the image you want. Our technicians will arrive on-site and provide you with easy to understand options for repairing your sign at the lowest possible cost. We stand behind our products with an industry leading warranty, and the desire to be a partner in the branding of your firm.